Mimaki Engineering Co.,Ltd. participates in “PHOTONEXT2013” held from June 25 to 26, 2013 in Tokyo, Japan. We showcase covers of photo albums and photo printed product samples. Printing operation is also demonstrated at our booth. We offer a variety range of applications to create unique photo albums by direct printing on diverse materials. UV inkjet printer highlights your precious photograph. Printing a precious photograph on varied products! We offer a wide variety of unique print applications. – Printing on A2 paper size - For more info, click here. 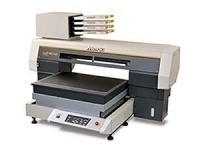 Digital Maki-e* and foil art work system：Creates metallic finish that wasn't able to be delivered. Digital engraving system：Provides metallic materials unique finish that cannot represent by color printing. Doming system：Adds value products by resin doming. *Maki-e: Japanese traditional lacquer art work. MAL group, JP marketing DEPT.